I have so many great ones for this. Passing 40 with flying colors. My plans for 40 are falling into place. Adventure #40…my finale…was skydiving, of course. I would NEVER have signed up for this on my own. The idea for this adventure was planted when our daughter was 12 and she said, “I want to skydive”. So we said, “When you turn 18, we will take you”. Well, guess what? She turned 18. Way faster than we expected. 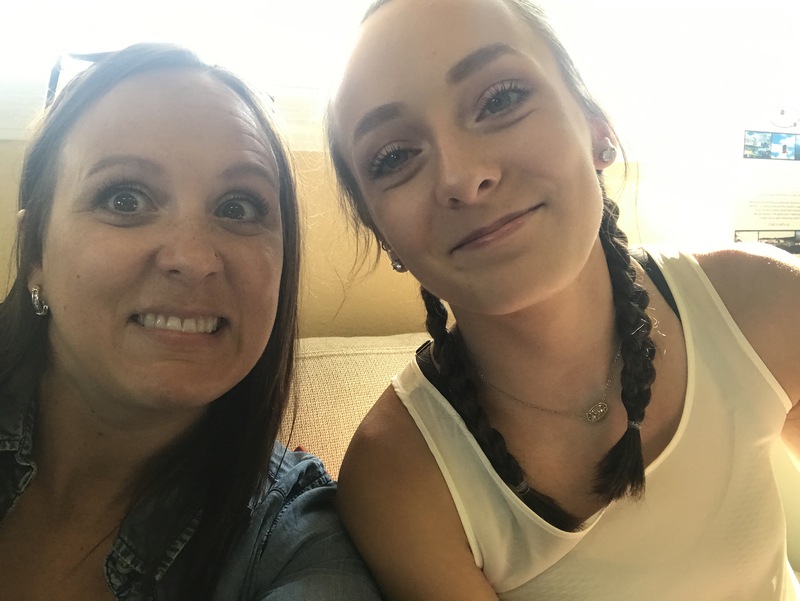 Her birthday was in November, but she wanted to skydive during the summer when it was warmer. And the idea for adventure #40 evolved. What better way to ring in 40 than by jumping out of an airplane. That is the most adventurous adventure, don’t you think? 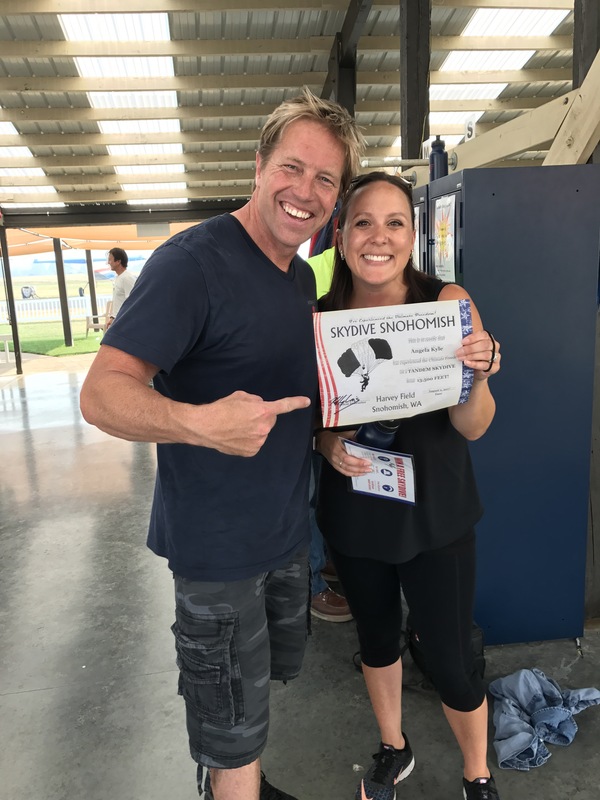 We booked through Skydive Snohomish. This place is good. The vibe is all sorts of just right. I didn’t feel too terrified. Well, maybe a little after signing all the paperwork. All the employees were friendly and confident and happy. You can tell that they love their job. The facility was clean, organized, professional, and well-maintained. All things you want out of the company that is packing your parachute. I kind of wanted to cancel like 500 times after I booked it. Mostly all on the actual jump day. My racing heart and sweaty palms were out of control. But I didn’t cancel. I did however, forget the clothes my husband asked me to bring since he was meeting us there after work. Yeah I left them at home. Almost 40 brain? Nerves? Sorry husband…that you had to jump in jeans and work boots. He was a good sport though and just rolled with it. Or…jumped with it. Ha. We got there. Signed our lives away. Paid the bill. And waited. Then we watched a video, practiced some moves on the ground and got suited up. Vlad was the instructor who went over the rules: Have fun and smile, arch and landing. He was so enthusiastic and funny and gave us the lowdown on our instructors. Someone there mentioned Vlad celebrated his 40th anniversary as a skydiver. Whoa! We met our tandem instructors. Who were amazing by the way. My instructor was Kelly who had just accomplished his 10,000th jump. Say what? I felt like my life was in good hands. He has the best energy. You’ll see what I mean in the video. Emilee’s instructor was Kory and Beau’s was Sam. They were our homies for the next 30 minutes or so. We loaded the plane. It took off. We waited some more. Then all of sudden the door opened and we were jumping out. There was no time to think. Or back out. It was incredible. It goes by so fast and it’s hard to take it all in. The free fall was intense. Then the parachute inflated and it was so peaceful and quiet. The view would probably be amazing if I could focus. It was a little overwhelming. The smoke from the fires made it hazy and hard to see the horizon. Kelly said that normally on sunny days, you can see all the mountains. I think it would take a second skydive to really appreciate the view. Anyone want to join me? Thank you to Becky and Jordan for being our cheering section and taking all the great photos! The experience was amazing. Beau and Emilee loved it too. You can tell by all the giant smiles. Totally something everyone should do at least once in their life. I mean why not? Here’s the video: I apologize ahead of time for the cringe-worthy moments. It’s just me…all sorts of awkward. Oh and fair warning, it’s over 10 minutes long. I don’t know how to end this blog. It feels like the end of an era or something. Well, Happy 40th Birthday to me! Way to go. You inspire me with every blog post. What a fun memory for your family. Have a great day! 40 is the new 20 so you go girl ! OMG! I was so nervous for you!!!! I am literally shaky now! Jaxon will have to start dreaming up something even more bold and outrageous before he turns 18! : ) Yee-haw! You did it! 41 before 41 begins tomorrow! Yeah…that was an intense experience! But it was so worth it! I don’t know about more bold and outrageous than that! I don’t think I could take it 😂 Now I’m working on my 50 before 50 (visiting all 50 states)! Great job on every adventure! If you would like to go in clear weather, I am your buddy. That was so fun to watch. Keep on bloggin’! 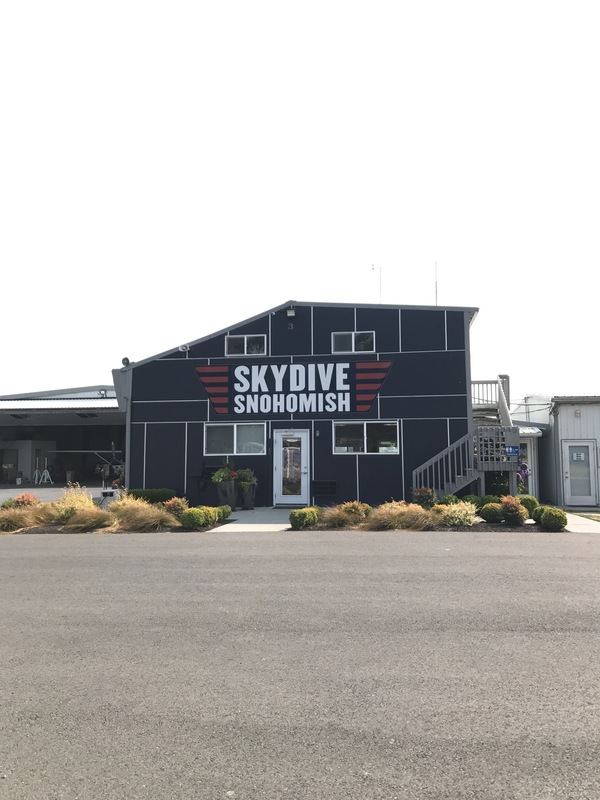 Oh, I keep promising myself to go here and do this…we see the skydivers all the time when we come through Snohomish…and then I remember, oh yeah, why am I jumping out of a perfectly good plane? 🙂 You are brave and awesome!